1 – There are two main types of dental drills: the high-speed and the slow-speed. The high-speed drill rotates around 250,000 RPM. That means it spins around more than 4,000 times each second! 2 – After using the dental drill on your tooth for 30 seconds, your dentist is subjected to as much bacteria as they would be had you sneezed right in their face (Source). That’s one of the reasons most dentists wear face masks. 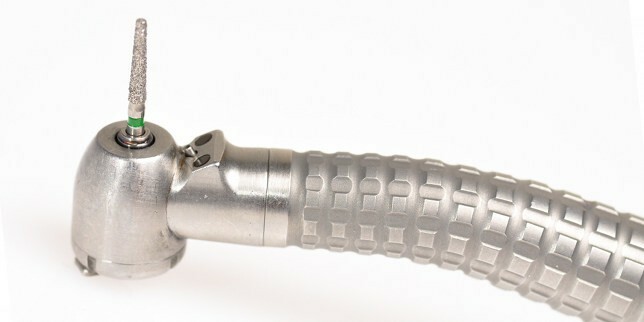 3 – The high-speed dental drill shoots out water as it spins, as you can see in the photo above. If it didn’t, the friction would cause your tooth to get so hot during a filling that it could possibly damage the nerve inside your tooth. 4 – Many dentists now refer to the dental drill as a handpiece to make it seem more friendly and enticing. 5 – The dental drill has to withstand the rigors of sterilization after every use, which means it gets heated to 250° Fahrenheit with pressurized steam for at least 15 minutes. 6 – The very first dental drill appears to have been a bow drill used by an ancient civilization about 9,000 years ago. 7 – The drill bits that dentists use are made of tungsten-carbide. Some have blades to cut teeth, like in the photo below, and others are coated with diamonds to give a sandpaper-like smoothing effect (see photo below). 8 – As recently as the early 20th century, many dentists used drills that were powered by a pedal that the dentist would pump with his foot. 9 – The distinct shrill sound that the high-speed dental drill makes can be a major factor in people’s fear of the dentist. Even for those who don’t have dental fear, the dental drill’s noise can be very unpleasant. 10 – Dental drills can be expensive, with many costing over $1,000. That’s a lot more expensive than your average home-improvement drill.